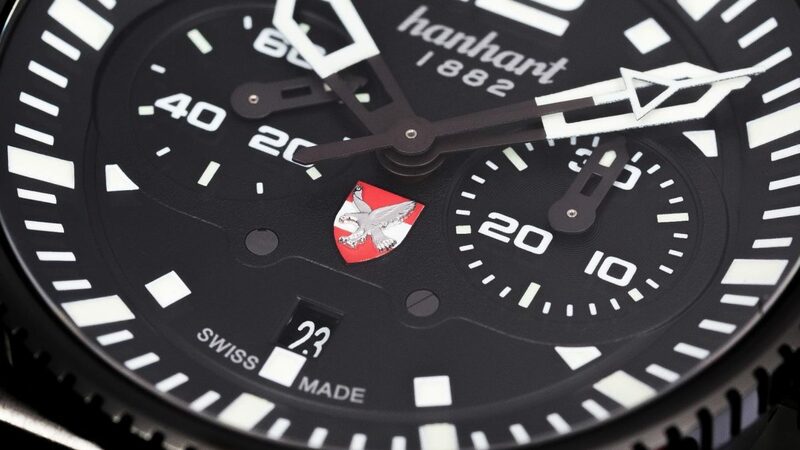 The new Hanhart chronograph – developed with and for the Austrian Air Force! The new PRIMUS Austrian Air Force Pilot Limited Edition is an homage to Hanharts decades-long tradition as a manufacturer of aviator chronographs. As early as the 1930s, pilots relied on the expert knowledge of the brand from the southern Black Forest, and to this day, nothing has changed about that. A structural change within the Army and the re-establishment of the Command of the Austrian Air Forces in 2017 inspired the Command to design a limited edition together with Hanhart. The chronograph combines the virtues of the Austrian Air Force such as precision, endurance and resilience with the principles of Hanhart: incomparable reliability, perfect legibility, ease of use and robustness. The PRIMUS Austrian Air Force Pilot combines the characteristic features of both sides, which are required for a perfect pilot’s chronograph. The new timepiece from Hanhart is limited to 100 pieces and is available in three different versions of case and bracelet. The chronograph can be ordered in a stainless steel case, a matt sandblasted stainless steel case and a black DLC coated stainless steel case. The bracelets are available in calfskin, vulcanized rubber and canvas and come with a folding clasp made from stainless steel (matt or DLC coated, depending on case material). The choice of case and bracelet does not change the limitation of the chronographs – every serial number is only produced once. The dial carries the distinctive emblem of the Austrian Air Force at six o’clock, which shows an eagle applied on the Austrian flag. Many details such as feathers and claws can only be recognized with eagle’s eyes or with the help of a magnifier. The bright luminescent numerals and index marks together with the red Hanhart details create a clear contrast to the black basic design of the chronograph and thereby contribute to a good legibility. The unique fluted bezel with inlaid red marking, the typical “bicompax” dial arrangement and the anodized aluminum red button reflect the typical Hanhart features. Despite the size of 44 mm diameter and 15 mm case height, flexible lugs provide a comfortable fit on the wrist. More information and pre-order here!